Written by John Sanders. Ross and John visited in June 2005 – the first of many visits. The first thing the locals tell you when you get off the ferry is that the weather has been unseasonably bad this year. Right. The first thing you notice is the wind. Sharp when the sun is out on a bright day; cutting like the teeth of a saw when it’s cold or raining. On the one occasion that the wind dropped, clouds of midges rose from the seaweed ready to engulf us; fortunately the wind came up again almost immediately. We came to like that wind. Preferably the new routes would be on stacks. We got off the ferry at 07.00 and went straight to a zawn we’d been told about by Pete Sawford, a local climber who we met on the boat. Ross had already been in touch with him by e-mail to get local intelligence. How weird that we should not only catch the same ferry but actually sit next to each other in the bar. 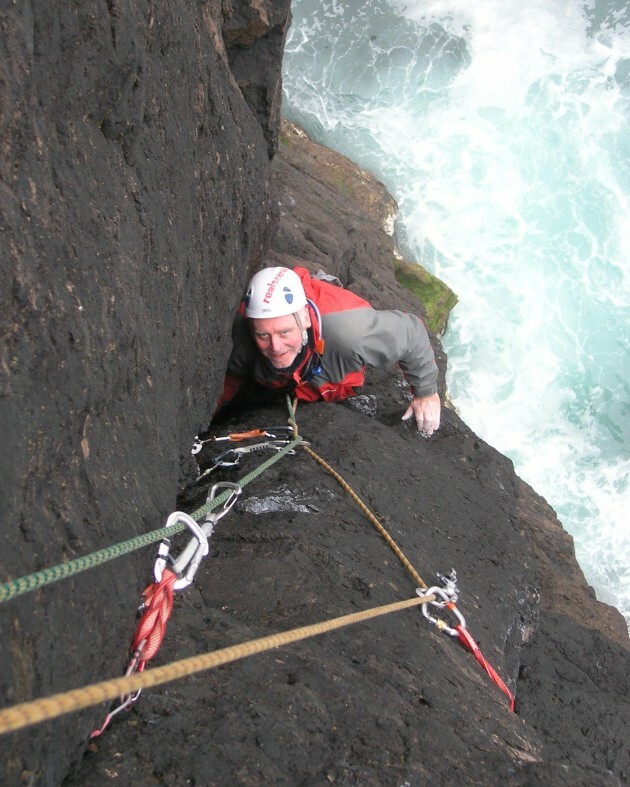 He was due back to Fetlar to see his wife but ditched that to come climbing with us. We found a short wall with routes up to twenty meters. Ross and I abbed down and began cleaning two of them and although it was overcast, amazingly it had stopped raining. By the time we were ready to climb, the sky had lightened considerably with even just a hint of sun. Ross on ‘Medusa’ first ascent, Hamar. The first route was awesome, pulling through a bulge at the bottom on small crimps, then up a crack line which split the face. Not only did it look compelling the climbing was excellent. The second route was a little more shattered at the bottom, turning to fine rock at about four meters height. A stiff pull through an overhang into a steep corner gave well protected consecutive 5b moves. The third route was on the face to the left, beginning with delicate moves up steep rock on small holds, which improved with height. The top wall was excellent value with just enough holds and protection at the right places. We finished climbing early to get the ferry across to Papa Stour, one of the small outlying islands, where we were met by Simon, the local school teacher. Not only did he put us up for the night, but also cooked us a cracking meal complete with a yummy bottle of red wine. It was an 05.00 start because we had to hit the stack, get off and then back to the ferry which left at 18.40. Sadly I had removed my wet suit from my bag the evening before to allow it to dry in Simons kitchen, now having arrived at the stack after nearly an hours walk with heavy kit, I realised I hadn’t put it back in the bag. The choices were simple, either Ross would have to do the swim in his cut-down wet suit or someone would have to go back for mine. Simon sprang to the rescue, declaring that he loved running, and while Ross and I set up the abseil, off he trotted, returning within an amazing forty minutes. Fit b*****d.
So it was on with the wet suit, spare clothes and gear in a dry bag, attach the fins to my harness and rap down the cliff. On with the fins, into the sea, bit of swimming, onto the little rocky outcrop next to the stack. Slip, slide across that, back into the narrow channel between it and the stack and then try to crawl, wriggle, levitate up the kelp covered slimy wall in a two meter swell with a one hundred meter abseil rope attached to the back of me. Piece of cake, fortunately I’d downed a couple of meat pies before the adventure which had turned my tummy into six bellies, (should that be ‘Piece of pie’?) therefore enabling me to float better, which was just as well because it took four goes before I managed to get a hold of the damn thing and pull myself clear. There was a bit of faffing to get the fins and wet suit booties off, but there was no way I could climb the wall above with them on. I eventually squirmed my way onto the plinth to cheering from the Ross and Simon, made the ab rope fast with good pro, then sat back and got changed into some dry clothes while the other two rapped down the ab rope straight onto the stack. We stayed in a Bod. For those of you who haven’t this is like a bunkhouse without any cooking facilities. It did have a fire which enabled us to dry our kit, and we had a double burner stove with us so the arrangement was perfect. A good curry from the local take-away and a few tinnies rounded of the perfect day. ‘Troll Catcher’, Walls of Troll. 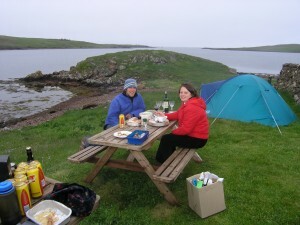 We headed off to Muckle Roe, a spectacular and truly beautiful peninsular on the West coast. Local knowledge enabled us to drive the seven kilometers up the unmade road, which was a real Godsend given that with one and half racks of gear, two climbing ropes, a one hundred meter abseil rope, spare clothing, food and water, and all the diving gear was hauling in at about thirty kilos per sack. You don’t have to walk very far under that lot before the old back starts to complain. We only had to haul the stuff for the last K and a half to the cliff top. The scenery is beyond description; words like awesome, spectacular, beautiful, wonderful, don’t do it justice; if you want to know what it was like – go. We wandered around those cliff tops, K after K, for about six hours until we finally found a lovely little sun-baked zawn of Granite mixed with volcanic rock which in the main was solid. We’d passed two good stacks on the way, both of which we considered un-climbable on the day for various reasons, but mostly ’cause they went at E something very hard. We started climbing in the zawn at 15.00 and by 22.00 we’d put up eight new routes of which six were real quality between diff and HVS. We called the area ‘The walls of Troll’, the climbs are: The Troll Catcher, Who’s afraid of the light? Hobbits for dinner, Troll Wall, Slapping the Troll in the face, Bad Troll, All Trolled up and nowhere to go & Party Troll. We stayed in the Bod again, and I ate the left-overs from the cold curry from the night before along with a few more tinnies, then feeling completely knackered hit my bag to be resurrected early the next morning. We found the corner crack at 18.00 and Ross was gagging for it, it looked f*****g desperate to me. Anyway we rapped in and off he went. On the first attempt he pinged, taking a four meter fall into space (it was grossly overhanging). Ross declared it must be done in style, ground up, so he retreated to the bottom and did a re-ascent replacing all his gear as he went. Strong shout. This time at the crux he got it right, and amidst whoops of joy from above I had this sinking feeling that it was my turn. It was solid 5c all the way through the crux moves and I pinged; an absolutely excellent lead by Mr. Jones, and a really good technical route with good climbing throughout. That evening we rocked up to Paul’s place where we discovered the delights of his croft and his family, namely Claire (his wife), and in descending order of age their youngun’s Jacob, Sam, Eleanor, and Isaac. This stack without question is in the top three for the finest quality rock of any stack I have ever seen or climbed, including The Old Man of Stoer and The Totem Pole. If this stack were on the mainland British coast it would receive ascents every week during the summer; to find such a beauty, completely unclimbed, is almost beyond belief, and only possible because of its extreme remoteness. No bird s**t, loose blocks, puking Fulmars – hey, can’t be a stack. We walked rolling hillsides for an hour from the end of the unmade road at the farm in Eshaness, until we reached the point. The big stack is off to the right, obvious and of no interest to us; the Faither nestles, hidden, against the West walls of an enormous natural arch, connected by a rock bridge which is exposed briefly at the lowest tide, but at all other times is awash with high seas. We rap the sixty meter cliff face onto the bridge; huge waves are periodically crashing over our intended path, salt spray flying wildly through the air, its pungent odor cleansing everything. When I get down Ross has already timed his dash perfectly and is on the stack plinth, safe from the wild sea. I count the waves until I’m sure that the sea recedes for longer on every sixth big wave – four, five, six, go; I’m running like a wild thing across wet greasy rock, my heart in my throat, legs pumping like pistons, expecting any second to be wiped from the bridge and slammed down into the roaring, spuming ocean. This is an awe inspiring, wild place, the daunting black rock walls oppressively heavy around us, reminiscent of some of the Geo’s in Mingilay. Access to the Faither Stack! I’m on the stack. Ross and I exchange a glance, each of us knowing and accepting the outcome of being washed into that sea. Now we can forget about it, at least until we have to return. As I have said the rock is near perfect, with excellent protection on all the routes with a single exception on the second route where there was a serious run out through some 4b ground which Ross dealt with very adequately. other side of the stack for a fourth it started to rain. By 17.30 it was hammering it down, which it kept on doing until we got back to the tent at 23.00. We were completely drenched of course but even this didn’t detract from an absolutely brilliant day, in fact if I had to pick a ‘best day’ of the trip, this would be the one. Needless to say we negotiated the huge waves on the bridge OK on the return, became completely exhausted jumaring the fixed rope to the cliff top, but still maintained a spring in our steps on the walk out despite the wind and the driving rain being directly in our faces. I was so tired when we got back to the tent I could only manage one cup of wine and a can of baked beans before collapsing into my bag for the night. We recorded the following lines: Don’t even think about going to Spain, Cheshire cat, Faither’s day & It never rains, it pours. So, not content with the previous days exploits, Mr. Jones dragged me back across the bloody hillside to The Faither peninsular again, this time to have a go at the cliffs surrounding the stack. Thankfully Paul came with us, which helped share the load of gear we had to haul, ‘cause my back was about done with that heavy sack. I did the first route with them, in fact leading the first pitch, but when Ross declared he wanted to go back down for a second route, given that Paul was all fired up to go with him, I hauled the spare gear and the ab rope out of there and made it back to the car for a couple of tinnies, and a bit of sunset watching. Sweet heaven, just sitting there on my arse sipping a brew, no sack on my back and nowhere in this damn world to worry about getting to, was simply the very best I could think of. The route we all did together was Memory Games, and Ross and Paul also did Sea of Change. We had another curry that night with shedloadsabeer. S**t I love being on holiday. We had spotted this stack earlier in the week when the weather was clear and fine and decided to leave it for a more overcast day; in the event this was one of the hottest days we had. Normal rules, yours truly dons the old wet suit, raps the cliff face, on with the fins and off for a little swim-swim. The fun came in two forms, first off the water was infested with jelly fish, and to top that once I’d hauled myself onto the plinth I was faced with a twenty foot solo at about 4 a/b in a wet suit. Lovely. Paul had come with us so while I got changed he and Ross rapped directly onto the stack(s). In fact this was a twin towered stack which at very high tide would become two independent stacks; we treated it as one stack with twin towers, and that’s what we called it – The Twin Towers. Funny that. Ross led a cracking route up the seaward face of the right hand one at VS 4b, and I took the other one at HS 4a. Good climbing on both stacks although the second tower was very loose at the top. Then it was back to jugging the line up the cliff face again, God my arms were getting knackered. In fact pretty much all of me was getting knackered. This great day out was topped by another curry back at the croft with Paul and Claire – loadsagood food and good wine. I reckon this article should be called ‘stack climbing on beer and curry’. We got up late, faffed around for a while making excuses about mindless s**t that just absolutely had to be done, when in fact we were just putting off that moment where we had to shoulder those sacks again, and eventually headed off to Eshaness. Bunch o’ slack jawed faggots ‘round here. There was thick mist everywhere; a kind of cold, wet, thing seeping into your very bones. Mr. Jones informed me, “That rock’s going to be wet and slippery” ‘Good reason to go to the pub’ thinks I. Then he found this hanging corner line which looked desperate from the top and even worse as I rapped down it. Overhanging, wet, on small crimps and jams. He was just getting me back for taking him to Ladram Bay. Hmmmmm……. The climbing turned out to be pretty damn awesome; sadly I can’t climb 5c crimps on overhanging rock in the wet, but Mr. Jones did a real good job on it. He called it The Goblin Cleaver. You work it out. We had a fabby Barbie that night back at the croft with Paul & Claire which was the hi-light meal of the week. I peaked early, trying to gather some energy for the next (last) day. About five or six months ago I pulled my Brachia muscle, believe it or not opening a f*****g window. Now that old muscle starts to hurt like a b****h as I get to climbing more and more, so given the throbbing in my left elbow I decided to have a day off. Luckily, both Pete & Paul had rocked up to climb that day – Peter, Paul & Ross (Sounds like a hippie group from the 60’s), so Ross wasn’t short of a partner. Also we ran into Mick Tighe and a bunch of his climbing buddies, and Ross ended up doing a route with one of them, John McClenaghan. They called it Aisha. We hit the 19.00 ferry out of Lerwick only to find there had been a Hells Angels meet on the Island that weekend and all the biker boys and girls were on our ferry. I crashed until 23.00 and then wandered through to the bar (open until 03.00) and got into some top biker drinking action with a few of the lads. Obviously I was nice and fresh for work the next morning. Despite the locals being full of doom and gloom about the weather, we really did have a bloody good week! All Routes have been added to the Database. 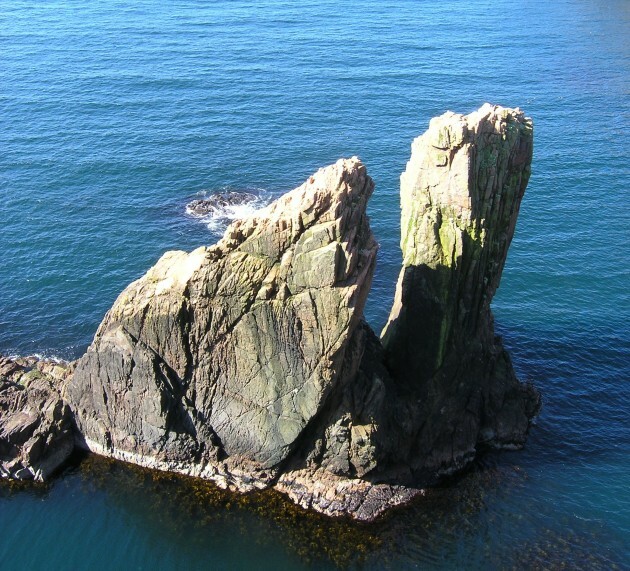 The spectacular red granite cliffs on the west coast of Muckle Roe mainly consists of poor quality rock. The Walls of Troll provide some good lines on weathered granite and an igneous plug in a sheltered geo. Right of the corner is a broken crack line. Climb this on poor rock. To the right of this the wall of igneous rock deteriorates. The next wall of blackened granite provides good climbing on solid rock from ledges that run along the bottom of the wall. The first route starts 3m right of a hidden grooved chimney. Climb the wall just left of a small right facing corner to a break at 5m and climb the crack-line above. Start 2m right of a short rightward slanting crack-line/break and below a thin crack-line that starts at the break. Climb the wall and crack-line to the top. Good, balanced climbing. Start from the ledge at the bottom of the chimney. Step left onto the face and climb the wall on small broken crack-lines, left of the two large crack-lines. Climb the chimney to the two crack-lines on the wall and climb these to the top; a disappointing route up two good looking crack-lines. Climb the chimney and the short final wall. Right of the chimney is another wall of clean granite with a slightly right slanting crack-line up the center. Climb the crack easily to a steep pull through a bulge at a hanging flake at two-thirds height and then to the top. The coast around Riva Geo, Red Head and along to Silvi Geo provide a range of climbs up 20m which are being developed by local climbers, but the routes have not yet been written up. The following routes had not been tackled prior to the ascents listed below. The routes are only affected at high tide and a large swell. Start at the centre of the first wall on the left from the descent to the beach. Climb the broken crack-line and then the face direct where the crack-line slants rightwards. 10-15m right of Snake Face is a hanging crack-line which is undercut with a lighter band of rock. Start below the hanging crack-line and climb to the small left facing overhanging corner. Pull around this into the crack and climb this to the top. Start 2m right of The Gorgan and climb up and rightwards to the base of the crack line. Climb this to the top. High in the grade. Only affected at high tide. The corner crack-line provides good climbing and an awkward crux at the top. 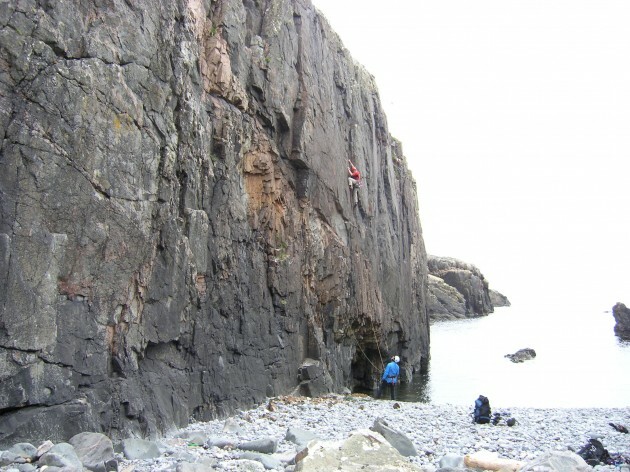 This route climbs a curving crack-line on an overhanging left facing corner system in the north west wall below the lighthouse and has very different character to the other climbs nearby. From the car park head west to a concreted pipeline north west of the blow hole. Follow the pipeline to its end, then head directly north to the cliff top to the top of a corner groove that forms the exit to the route. The route suffers from a small amount of seepage after rain at the crux. 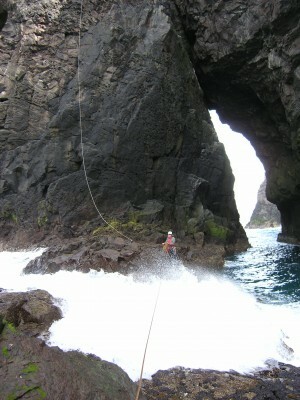 Abseil to a triangular ledge in a cave beneath the overhanging cliff face. From the ledge climb a rib to the hanging crack-line. Pull around into this and make difficult moves to easier ground and a final lay back crack to the top. Climb the wall right of Atlantic Sea. Bold but never strenuous. A large rack helps creative gear placement! The Wind Cries… the description for this route seems to climb the same rib and groove/scoop as Mary? 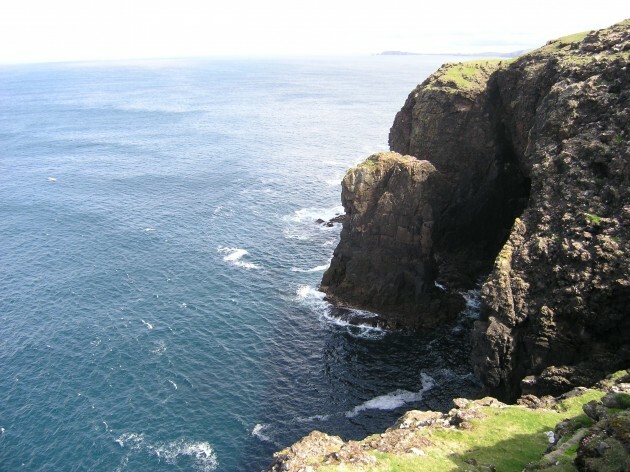 The Faither (far point) is the most northerly point of land to the west of Ronas Voe. This fine 35m stack is hidden away from view by the surrounding cliffs. Access to the stack is gained by a 55m free hanging abseil from the cliff top north west of the stack to a wave washed platform, followed by a dash to the stack across a channel between waves up to mid tide. 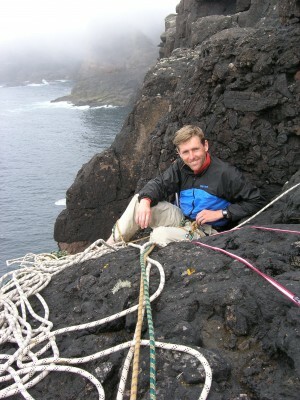 A 100m abseil rope is required as anchor points are spaced out. Start to the left hand side of the face below a right slanting groove that starts at one-third height. Climb this and the groove to the top on good rock. Guaranteed to bring out a big smile in all who climb it, this route climbs the center of the face on excellent rock. Climb to a small left facing corner and climb the wall to its right and the crack line above. As this ends step left in to a shallow groove and then to the top.. Climb the v-groove to the right of the wall, then traverse around on the south east wall which is climbed to the top. There is a poor quality line on the north east facing wall which is best approached by abseil from the top of the stack. Climb the wall to the left of the large hanging left slanting crack-line on poor rock. 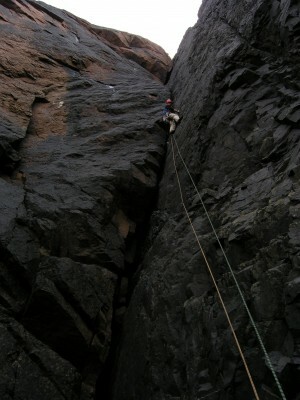 This is the wall opposite Faither stack which is descended by the line of the abseil for approaching the stack. 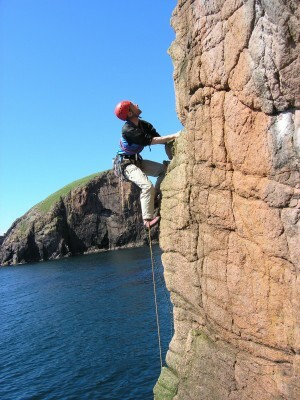 Both routes can be climbed from the tidal platform as an alternative to a long jumar up the wall after climbing the stack. The wall is broken in its lower half by a black right slanting ramp line and is made up of large pockets. A wide range of cams are useful. Abseil to a large ledge at the bottom of a right slanting ramp/crack. 1. 20m 4a Climb the ramp/crack to the large spike belay. 2. 35m 4b Climb the wall to the left of the belay for 3m and then traverse along a ledge (possible belay) before making an exposed pull around the arête onto the wall left of the arete. Climb large pockets up easier ground to beneath an overhang to a corner and climb the wall on the left to finish. Abseil to a small niche to the left and slightly lower than the start of Memory Games and just right of a left facing corner. Climb the arête to another smaller corner at 12m. Step right back onto the arête and climb this in a fine position to a short steep groove. Climb this direct and the wall above to easier ground. Finish at the same short final wall as for Memory Games. Two fine 20m stacks guard the entrance to Kirsten Hole. The stacks are separated in places by only 10cms, but they remain two separate stacks. 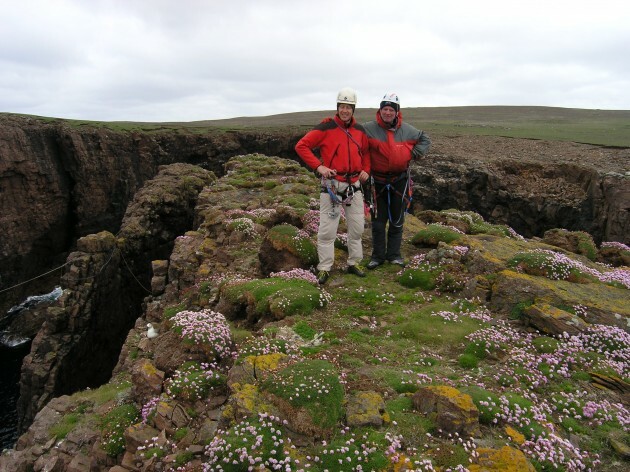 Approach: Abseil from stakes to a tidal corner directly north of the stacks and swim to the platform on the west end of the west stack with the end of the rope. The second then relocates the abseil to a block opposite the stack to make a 40m abseil/tyrolean straight onto the stack. 100m rope is required. Retreat is by tyrolean from the top of the stack. Climb the west arête direct. It is possible to step on the summit of the east stack from the west summit. 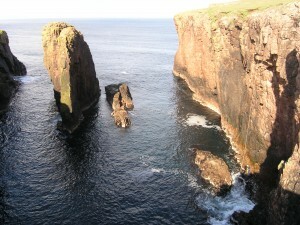 The stack has two distinct towers which are separate in only the largest of seas. Approach: Abseil from stakes or blocks to ledges opposite the stack and swim the 7m channel to the stack and set up a 50m abseil/tyrolean on the connecting platform between the stacks. Retreat is by jumaring back up the tyrolean to the cliff top. The swimmer is required to solo a five meter wall at about 4a/b to reach the col between the stacks. Climb the south west arete on good rock for 7m then step right and climb the corner to the top. Descent is by abseil. Climb the stepped wall between the towers to a corner and climb the wall on the right to the top. The corner climbed direct is 4c. Descent is by an easy scramble down the east ramp.